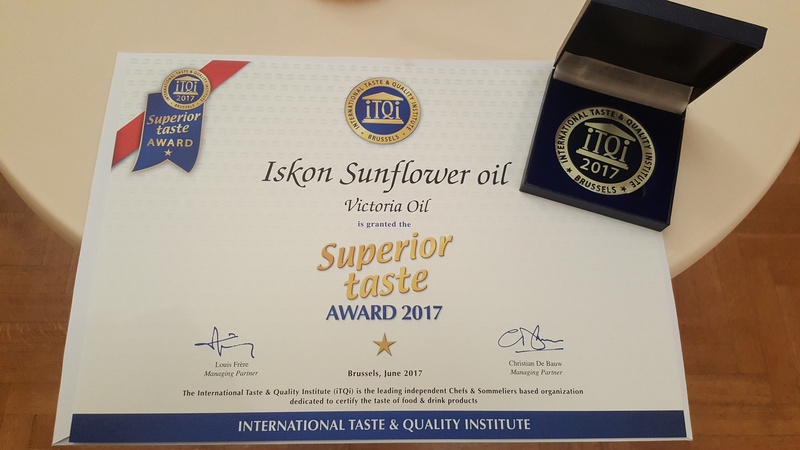 For the second time in a row, Iskon edible sunflower oil was presented with the prestigious “Superior Taste Award”, awarded by the International Taste and Quality Institute, iTQi. This is a leading global organization made up of chefs and sommeliers awarded with famous Michelin stars, who test food products and promote top quality of food and drinks. The jury, made up of 125 chefs and taste assessment experts from 15 best known European culinary associations, assessed the taste, texture, aroma, appearance, and the overall consumption experience. A blind sensory analysis was conducted following rigorous procedures – the products being tested were not in their original packaging and all markers of brand identity had been removed. At the award ceremony held in Brussels on June 14, the award for Iskon sunflower oil was presented to Victoriaoil, a Victoria Group member company. “Iskon oil has been presented with the international ‘Superior Taste Award’ once again, which serves as a confirmation of continuity in terms of Iskon oil’s high quality and exceptional sensory characteristics, which is why it is used by famous restaurants and catering facilities, both in Serbia and worldwide. Given that more than 90% of households in Serbia use sunflower oil, I believe it is important for them to know that top quality Iskon sunflower oil, produced in accordance with the highest global standards, is at their disposal for everyday food preparation”, said Vladimir Šarac, Quality Control Director at Victoriaoil.